You need money, and you need it as soon as possible? You’re a decent writer, and you’re ready to put some effort in? 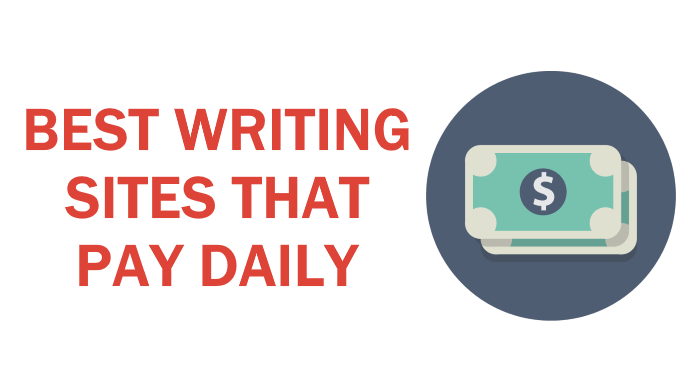 In that case, you’ve come to the right place, cause here’s the list of best websites that will pay you for writing – on a daily basis. Doesn’t really matter if you have just dropped out of the workforce, if you’re a student looking for a part-time gig, or if you are a full-time homemaker looking to make some extra cash, freelance writing is an amazing opportunity for anyone who is well organized and able to work from home. Freelancing seems great, but you don’t like waiting for the money you earned? When you are looking for freelance work, getting paid writing gigs seems to be rather challenging. Some writers would even say that it’s the hardest part of their career. And when you do find a freelance writing job that is paid, you usually have to wait for weeks, or even months in order to get your hard earned cash – cash that you need right now, and not a week or a month from now..
Nobody likes it, but, you see, the long wait is not without a good reason. There are all sorts of swindlers and frauds online, so websites that help you find these jobs need to make sure everything is alright, and that both you and your employer are legit and safe to conduct business with. When you realize how this works and once you check out our list, you will see that opportunities are numerous and can be found everywhere. Businesses that are online-based are always looking out for new freelance writers who can create content for their online publications or websites. However, these jobs are not always come down to just writing! Sometimes you’ll need some SEO knowledge, basic PR or marketing skills, which is why this job market is always interesting – everyone can find a niche that they’ll genuinely excel in. Plus, there’s work for every level of expertise – opportunities are equally present regardless of whether you are a beginner, a seasoned professional or someone with intermediate experience. Just be aware that there are two things that will determine your remuneration – the quality of your writing, and the terms that person who is hiring is offering. Sometimes these pay per day jobs are too simple to earn you a high income, but if you combine two or three of these gigs, you could end up with a nice amount of cash every day. And, if you ultimately put in enough time and effort, you can ensure yourself a decent income. So, if you’re willing to give working from home a chance, we made a list with the best writing sites that pay daily that can help you start earning quickly..
We combed the web to find the best writing jobs that offer a chance for steady freelance work, while at the same time paying on a daily basis to your PayPal or bank account – we have to warn you though, there aren’t many, but they are tested, and the freelancers who gave them a shot are satisfied. They find on-demand workforce for their clients. When you look through their site, you will see that there are offers for every field of work, and all sorts of writers are welcome. All in all, this is a marketplace for small jobs, such as data entry, research and writing tasks. This is a great platform for those who are just starting their writing careers, looking to enhance their skills and build their resumes. When you do well, their Proficiency Leveling Program rewards you, and you level up. There are 4 levels – beginner, intermediate, advanced, and expert. As you level up, so do your earnings and the amount of work you can find. You can work all day long, there are no limitations, as long as your English is good enough for their clients. Every task is explained precisely, and they are mostly rather simple, and require little to no skill, so you can finish them quickly. As soon as your task gets approved by the client, money will be on its way to your PayPal account. Within 24-48 hours, that cash will be available for you to spend. You don’t have to request a payment or anything similar, it’s all done automatically. Once your client pays for the finished task, Upwork takes 20% (that’s their fee), and then the money you earned is on your account, but it isn’t released until the official 5-day security period passes. So basically, your client can pay daily, but you’ll have to wait for that money to reach you. Money can be sent to your PayPal, Payoneer, via a wire transfer or directly to your bank – the choice is yours. This website connects large corporate clients with freelance writers. So, you have to be good. Really good. If you don’t have at least several years of experience under your belt, skip this one. The main flaw here is the fact that you cannot actively look for work yourself. You fill out your portfolio and wait for their algorithm to find you and suggest you to a client. Once the client accepts you, and your idea, you get an assignment, and you are paid as soon as you submit your first draft. Sure, there are month long assignments, and jobs that are paid per hour on a weekly or monthly basis, but in the end, it all depends on what you agree on with your client. The great thing here is that portfolio you have to make. Once you create it, you can link it in your CV, sort of like a LinkedIn account. What’s more, you can put everything you did in it, as it is perfectly presentable. This can be a great thing for you, as it makes presenting your previous work simpler and visually more pleasing, so you can send a link to this portfolio to potential clients independently from the platform. The pay rates are great here, as most assignments are in the range of $0,75 – $2,00 per word. Flat rates go from $200 up to $500. Once you accept an assignment, payment is placed in escrow, as soon as the assignment is approved, you can withdraw your payment to a PayPal account. No wait, no fuss. If you manage to finish everything quickly, and per client’s requirements, you can get paid in just a few hours. They pay you for posting comments on blogs and forums. This site is great for beginners. You don’t have to write boring articles or do research, and there are no stringent requirements. Postloop will pay you to post on forums for their clients. The point is that those clients want people talking, so their forums will be more successful. You have to be a native English speaker and your spelling/grammar has to be decent (easy fix if your spelling isn’t perfect is Grammarly). Now, there is a single problem with this website. Namely, it has a bad reputation in the freelance community. Some freelancers started working through Postloop, and expected to earn a minimum of $5 per hour, so they got disappointed when they realized that their goal is not easily achieved here. Postloop pays regularly, but it’s harder work, for little pay, and you have to be ready for that. There’s no limitation as to how much you can earn or how often you can write, but, according to people who are active on Postloop, the most money you can make here in one day is $9. So, this is best used as a practice ground before you move onto the more difficult and demanding tasks, or as an additional source of income when you have some extra time on your hands. You have to earn $5 in order to cash out, and the money will be on your PayPal account within 24 hours after you do. Plain and simple, money within a day. Research and surveys for their clients, where you get to earn money and rewards for your opinions. Doesn’t matter if you are a pro or a beginner, you just have to be honest. This survey panel has its own system that tracks your responses – TraitScore, which they use to rank writers. The point is that you have to be honest with every survey you take, as every response you give goes into your TraitScore. You have to give correct demographics and traits, and you can’t change your mind too often. The point is that they are not looking for your real name, but they insist on your real opinions. That’s what you’re being paid for, after all, so be consistent. Every time when there’s a survey that you can answer to, you will be notified by PaidViewPoint, so you don’t have to worry and check every five minutes if there’s something for you. There’s a limit to how much you can earn on this platform, so we don’t recommend that you rely on it as your sole source of income. You have to earn $15 before you can cash out your earnings. They pay via PayPal within 24-72 hours after you cash out (depending on your country), but, bear in mind that you can take an Amazon or Walmart gift card instead – which, we have to say, is a nifty perk. Next to these, there are many websites that pay bi-weekly, weekly or monthly. The most popular ones are Fiverr, iWriter and Freelancer. They work similarly to Upwork and OneSpace, there are multitudes of jobs for every skill set, expertise level, and field of interest, you just have to wait a bit longer in order to get your cash, as their verification processes and security periods are longer. Also, there are websites that pay when your articles are accepted and published. If you are willing to take that chance, and you have faith in your skills, you can try College Humor (if you’re funny, of course), Cracked (funny again), Screen Rant (entertainment), or Listverse (list articles). You can also look through your favorite websites, and check if they are looking for freelance writers. As you can see, for most of these websites, you will need a PayPal account, since that is their only payment method. Here’s what you need to know about PayPal before you start: if you don’t have an account, you can sign up for free. You can transfer the money from PayPal to your bank account, or you can ask for their debit card that works just like any other debit card, and make purchases normally. Once you register, everything is simple, but pay attention to their fees. When you’re getting paid, PayPal fee ranges from 1.9% to 3.4%+, plus there are cross-border fees and currency conversion fees. Also, when withdrawals are in question, if the bank you are withdrawing your funds to is not in the USA, it can cost you anywhere between $1 and $8 per withdrawal. So, we recommend that you don’t cash out every time you make a dollar or two, but wait until the money piles up a bit, so you don’t cripple your earnings with fees. The main reason to make this list was helping you out. We know how difficult it can be to begin a freelancing career or to kick start a digital nomad lifestyle. These are the very best options available, so they should help you to make a step in the right direction. Hope we helped, and that these websites will help you as much as they helped us. Good luck on your freelance journey!